Go Shuck An Oyster: Island Creek Oysters - great tasting, great fun and a great business. Island Creek Oysters - great tasting, great fun and a great business. 1. Island Creek Oysters has an informative website with lots of oyster info and very colorful photos by David Grossman. 2. They have a Facebook page with 1141 fans. To become a fan, just sign up for a free Facebook account and search for Island Creek Oysters. Island Creek has a fun contest going on right now called, "Where in Boston is CJ"? CJ, also known as the Oyster Dude, was recently featured in a magazine called the Improper Bostonian, click here to read the article and to learn more about him. The current contest consists of finding CJ while he is driving in Boston then photographing yourself with him and his truck. Then you must post that picture on the Island Creek Facebook page. 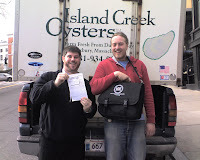 The most entertaining picture will win ICO stuff: oysters, gear, all things Island Creek. Wish me luck in the contest. I would love free oysters or anything else from Island Creek! 3. They have, "Shucked". Shucked is a blog authored by a journalist, Erin, who spends her days working on the oyster farm. 4. Finally, Island Creek has 62 followers on Twitter. To learn more about Twitter or to sign up to receive tweets, click here. Clearly this is group of fun people but make no mistake about it, when it comes to work, they are all business. Have a look at this web page for more information about their business story. Now, I can't stop thinking about oysters but I think I might have to wait until the May 3rd event at B&G Oysters.